"Fan into FLAME" all He has called us to! 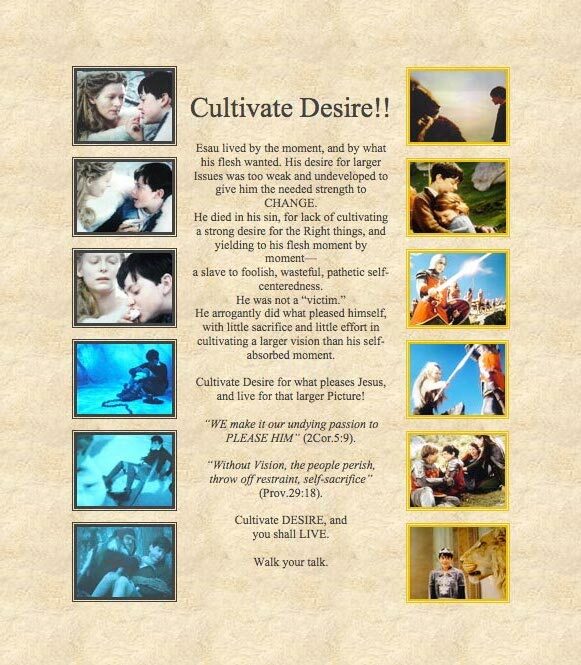 Cultivate Desire!! Esau lived by the moment, and by what his flesh wanted. His desire for larger issues was too weak and undeveloped to give him the needed strength to CHANGE. He died in his sin, for lack of cultivating a strong desire for the Right things, and yielding to his flesh moment by moment-- a slave to foolish, wasteful, pathetic self-centeredness. He was not a "victim." He arrogantly did what pleased himself, with little sacrifice and little effort in cultivating a larger vision than his self-absorbed moment. Cultivate Desire for what pleases Jesus, and live for that larger Picture! "WE make it our undying passion to PLEASE HIM" (2Cor.5:9) "Without vision, the people perish, throw off restraint, self-sacrifice" (Prov.29:18). Cultivate DESIRE, and you shall LIVE. Walk your talk.